Have you ever wondered which New Zealand bird was the first to be given a published scientific name? The unlikely answer is the broad-billed prion, named as ‘Procellaria vittata’ by a 22-year-old Georg Forster in 1777. The second species was the little penguin (as ‘Aptenodytes minor’) named by Georg’s father, Reinhold Forster, four years later. The two Forsters accompanied Captain Cook as naturalists on his second visit to New Zealand in 1773-74. Their first landfall was Dusky Sound, which the officers and crew of the Resolution explored for 6 weeks during March-May 1773. The prion and the penguin were among about three dozen bird species that they observed, shot, painted, described and ate during their stay. And both species were observed in Dusky Sound by Te Papa scientists in 2016 (see Dusky Sound – rich in history and wildlife). Searching for burrow-nesting petrels (including prions) was a major focus of our visit, and our findings were a stark contrast to what Cook and his entourage had found 243 years earlier. 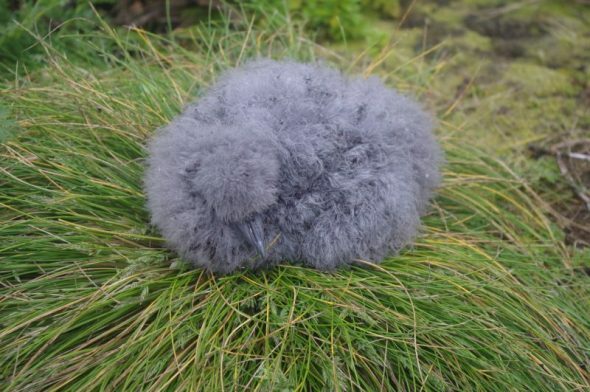 The Forsters had noticed flocks of prions, which they called “grey eggbirds”, “silvery petrels”, “blackbanded petrels” and “blue petrils” over the open ocean as they sailed eastwards towards New Zealand from Cape Town. It is likely that they confused several similar prion species during their voyage, but it is currently accepted that Georg Forster’s 1777 description refers to the birds that they encountered in vast flocks on and around Anchor Island and the Seal Islands in Dusky Sound. Broad-billed prions lay their eggs in burrows or rock crevices in August or September, and most chicks fledge by Christmas. The Forsters were clearly mistaken when they referred to “innumerable young & old birds…which live in the above mentioned holes & are fed there by their parents”. There could not have been prion chicks present in April, but adult broad-billed prions are known to return to their breeding colonies at that time of year. There is a hint that the Forsters were hearing chicks of other petrels nesting alongside the prions. When John Latham summarised their observations in 1785, he described “On the north-west part of Anchor Isle [prions were] found in immense numbers, among other species; some on the wing, and others in woods, in holes in the ground close to one another”. Latham’s cryptic reference to ‘among other species’ is the only clue that there may have been other petrels nesting in burrows among the prions in Dusky Sound in 1773. We found two other species there in large numbers in November 2016 – sooty shearwaters and mottled petrels – both of which have downy chicks in April. Why did the Forsters fail to mention them? Broad-billed prions were present in vast numbers in Dusky Sound in 1773, but had apparently gone 120-130 years later, when Richard Henry failed to find any during his 14 years living in Dusky Sound. 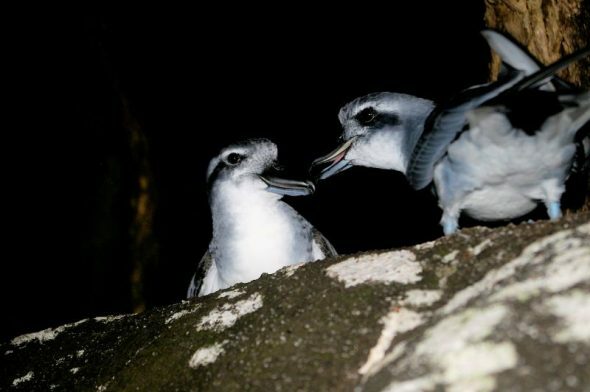 “Captain Cook mentions great numbers of blue petrels on Anchor Island in April, but I never saw one there, and thought it might be for want of going at the right time. So last April  I had a good cruise round there at the same place and date, but there was no sign of them”. 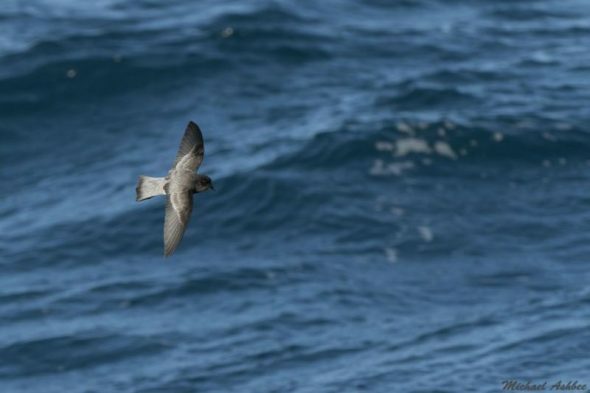 A survey by Kim Morrison in 1984 also failed to find prions, but he did find sooty shearwaters breeding on the Seal Islands and Petrel Islands (near Anchor Island), and mottled petrels further up Dusky Sound on Front Island. Our survey of 59 islands in Dusky Sound was timed to maximise our chances of finding all three species, as broad-billed prions have large downy chicks in November, while sooty shearwaters and mottled petrels are courting and preparing their burrows for laying. We were delighted to find broad-billed prions breeding on two small islets among the Seal Islands, plus we found feathers likely to be of prions on several other islands. As the Forsters never actually saw a broad-billed prion chick in 1773, the six chicks that we handled (plus two old eggs) are the first confirmed breeding records for broad-billed prion in Dusky Sound (the type locality). The most likely cause for the near extinction of broad-billed prions in Dusky Sound is predation by rats (initially) followed by stoats. 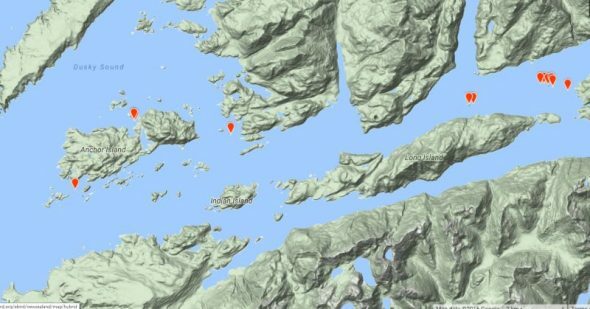 Fortunately all the smaller islands in Dusky Sound have now been cleared of these introduced predators, giving many vulnerable birds and insects an opportunity to recover. 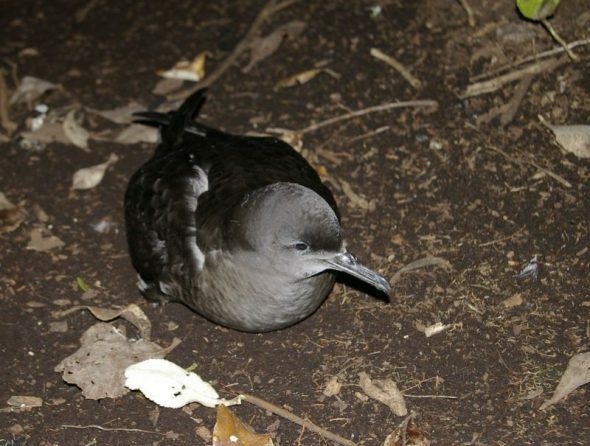 In addition to the prions, we found sooty shearwaters breeding on 35 islands, with a minimum estimated population of 21,500 pairs, and mottled petrels on 12 islands (5500 pairs). Surely they were both present in good numbers when the Forsters visited Dusky Sound? 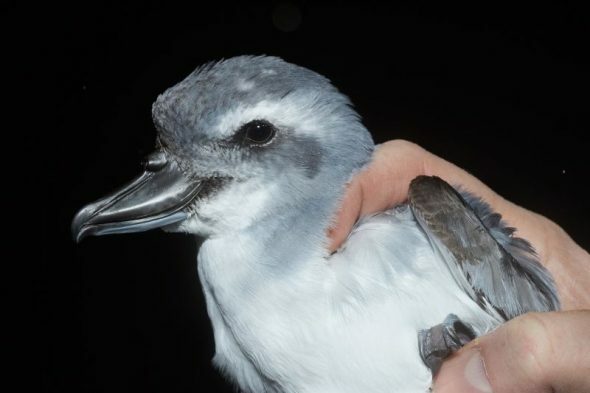 Why did the Forsters fail to report other petrel species? 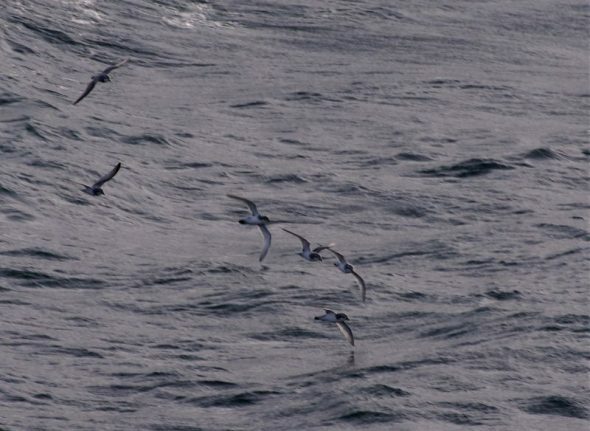 All these petrel species visit their colonies at night and (unlike us!) the Forsters did not have the opportunity or equipment to undertake night surveys. Also, weka were much more numerous and widespread in Dusky Sound in 1773 than they are now. It is likely that petrels breeding on islands with weka chose sites well protected by rocks and tree roots, making it difficult for weka (and naturalists) to access nest chambers. Reinhold Forster referred to hearing “a noise of young birds in holes under huge stones & between rocks, but could get none of them”, and Captain Cook himself described the petrels as being “under the roots of trees and in the creveses of rocks where there was no getting at them and where we supposed their young ones were”. 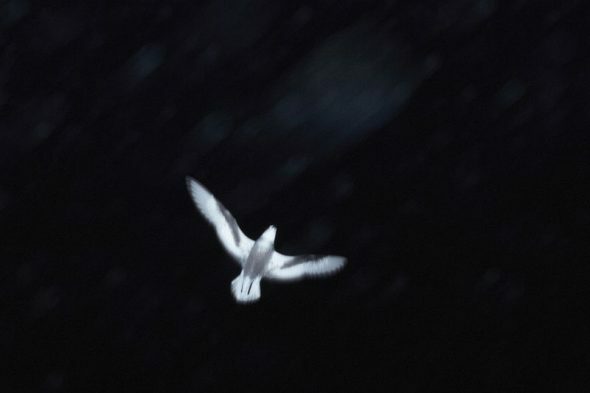 The prions were the only petrels that they identified flying about at night and leaving at dawn, but it is likely that these two larger petrel species were breeding among them. One of the survey techniques that we used was shining spotlights over islands at night (from the boat), to see what species of petrels were flying over them. Many species of petrels (including all the Dusky Sound species) are attracted to bright lights, and this technique was used to rapidly assess whether an island held an active colony or was empty habitat. 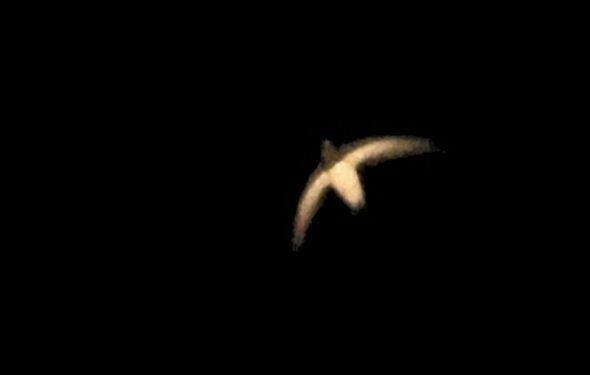 To our great surprise, we saw tiny grey-backed storm petrels in the spotlight beam at two sites, including at least two birds (seen simultaneously multiple times) alongside Oke Island in Wet Jacket Arm. This site is completely surrounded by mountains, and is a tortuous 27 km from the open sea. There is a long history of grey-backed storm petrels turning up in odd places throughout Fiordland, when other petrel species rarely do so. 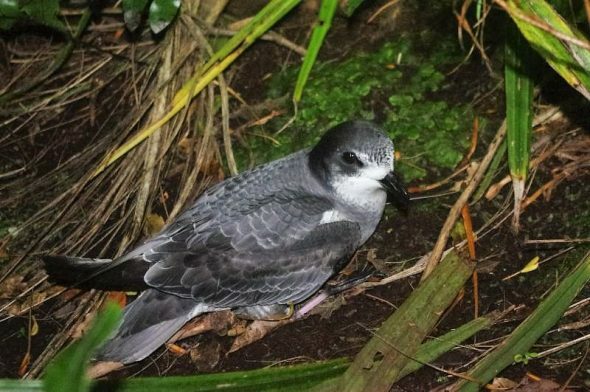 As the nearest known breeding sites for this cryptic little seabird are on the Chatham Islands, Auckland Islands and Antipodes Island, seabird biologists have long wondered whether grey-backed storm petrels might breed somewhere in Fiordland. Our observations of at least three birds in calm conditions (i.e. not storm-driven) so far from their normal open ocean habitat strongly suggest a local breeding site. 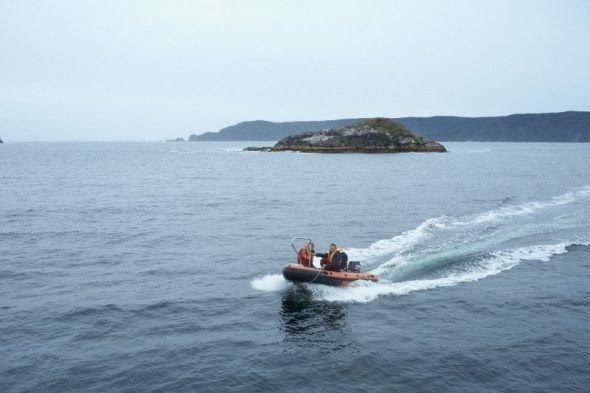 The Te Papa team at Dusky Sound was based aboard the Department of Conservation vessel Southern Winds. DOC staff assisted with the surveys as well as authorising our work and providing logistic support. Of course the Forsters had no torches or headlamps. 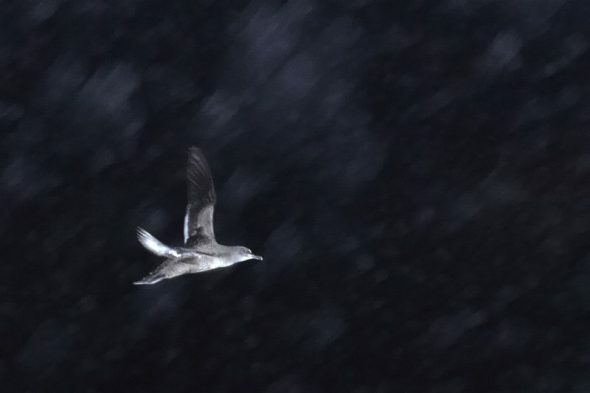 Few nocturnal petrel colonies were therefore surveyed by night in the 18th or 19th C – anywhere. Nocturnal birds like kiwi were only discovered by Europeans after 1813 & Laughing Owls after 1844. Cook’s naturalists rarely mention nocturnal species. We were aware of the limited ability for 18th century naturalists to undertake night surveys. In addition to the petrel species overlooked, the Forsters failed to record morepork, two species of kiwi, and kakapo, all of which would have been abundant in Dusky Sound in 1773. Good to hear from you. Yes, there must be much more waiting to be discovered. Most of our island landings were short (30 min to 2 hours), and there are a similar number of islands within Dusky Sound that we didn’t land on. Very interesting to read about birdlife in places I will never be able to visit.